Circular Italian rattan table by Bonacina Laminated wood centrepiece. 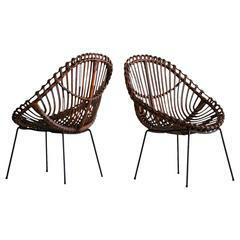 Pair of Italian rattan chairs in sculptural shape and black iron base in the style of Franco Albini. 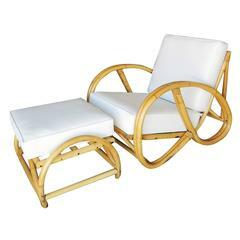 Bonacina rattan swing chair, circa 1960. Deceptively comfortable and relaxing!! For indoor or outdoor use. "P3" armchair by Tito Agnoli Bonacina Italy, 1960s. Tubular steel frame with woven wicker. 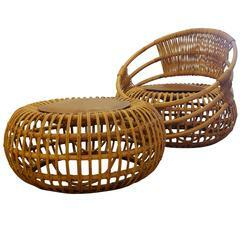 Two bamboo armchairs made by Bonacino in Italy in the 1950s. Very beautiful shape and first class craftsmanship. Gently restored and in good condition. 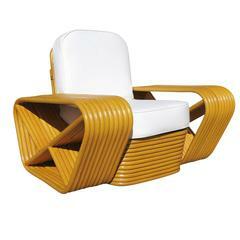 Wicker lounge chair attributed to Tito Agnoli for Bonacina.